I'm squirreling away gifts into the Christmas-Closet and knitting mittens. A small pile of books is forming. I noticed something they share in common. They recall true events. What a strange coincidence. I'm guessing that if an adult finds the events interesting, a child would, too. People of all ages enjoy (and can learn something) from a well-written picture-book. This gentle story was handed down by the author's grandfather. 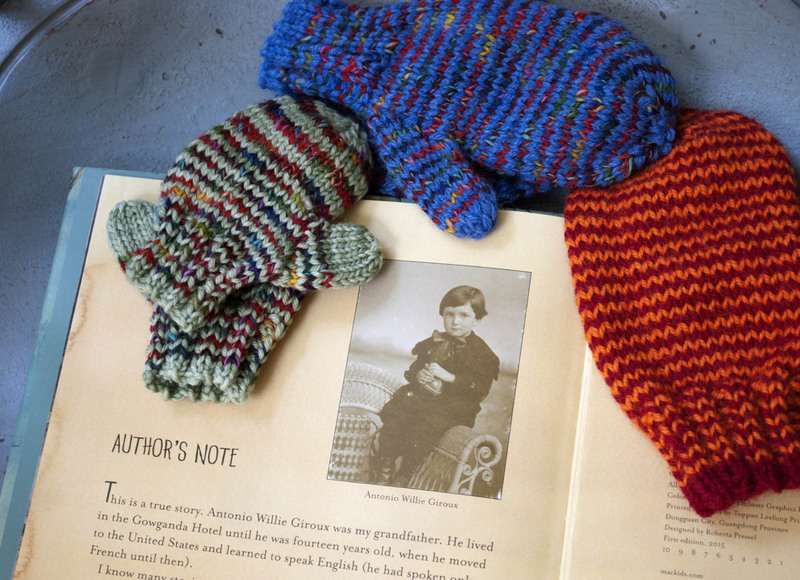 An old photograph of him as a boy is in the "Author's Note" - surrounded by the mittens I made for my 3 grandchildren. The author's grandfather. Mittens for my grandchildren. Pages inside "Out of the Woods"
I purchased a used copy of Mailing May by Michael O. Tunnell. Although the story is fictionalized the historical facts are accurate. 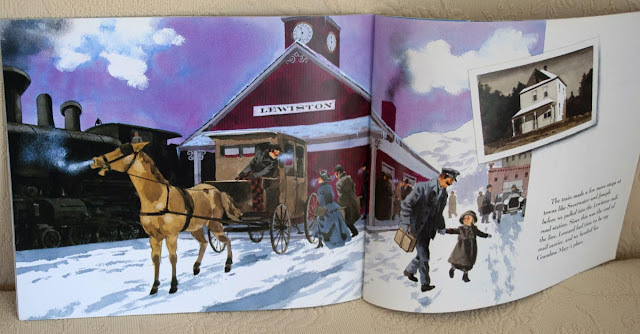 Five-year-old May Pierstorff really was mailed from Graneville to Lewiston, Idaho the winter of 1914. May would like to spend some time with her grandmother but a railroad ticket would cost a full day's wage for her father. He can't afford that. But May's parents come up with an idea. Mail May. Because she, with her suitcase, weighs under 50 pounds, she is classified as a baby chick. Her uncle Leonard works in the postal car. He could easily watch over this special live parcel. The train's conductor approves it. Just before sitting down to write about The Matchlock Gun by Walter D. Edmonds, Dean shared a bit of news. The thought had already crossed my mind that it is doubtful whether The Matchlock Gun would win a Newberry Award today. Society thinks differently than it did in 1942. Therefore, when the news reached my ears it seconded my suspicions. Today, general opinion seems to be that guns are bad. To those, however, who believe in the right to self-defense, the 2nd amendment of the U.S. Constitution, and small government, guns are not bad. It is violent people and big, tyrannical governments that are bad. It's Colonial America in The Matchlock Gun. Young Edward's father is away defending a village near Albany, New York, from an Indian raid. Edward, his mother and little sister, are home. Near the end of the story Edward (frightened but brave) is forced to use drastic measures. His mother is being chased up the hill and to the door of their cabin by an attacking Indian. Edward, in the kitchen, stands behind his grandfather's heavy antique Spanish gun (that is propped up on the table). He has one shot. The author's story was handed down to him as part of his personal family heritage. This rooster pin-cushion has wings. Missouri Star Quilt Co. has a chicken pin cushion tutorial. 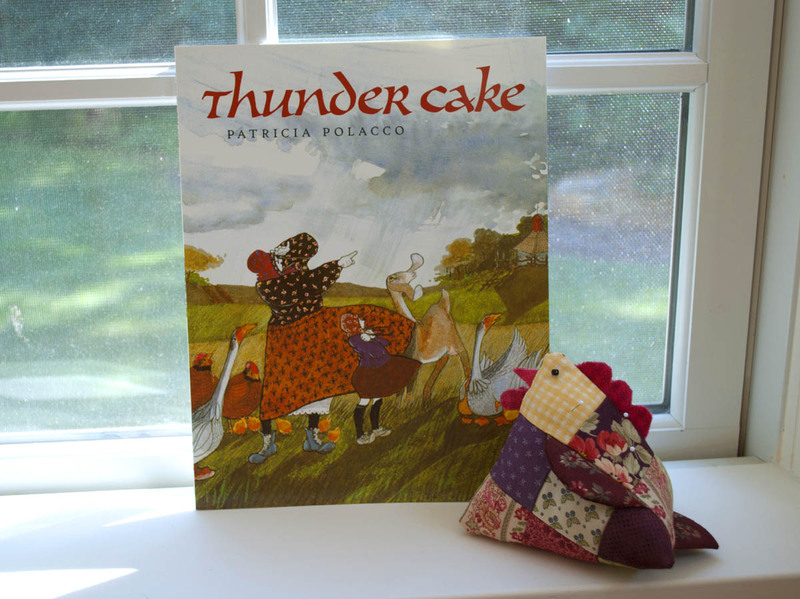 I'm uncertain whether Thunder Cake by Patricia Polacco is a memory from the author's childhood. But it seems so. She dedicates it to her Babushka Carle and writes in first-person, starting with: "On sultry summer days at my grandma's farm in Michigan . . .
Dean and I went bonkers at this enormous used-book sale this summer. A Russian-immigrant grandmother deals cleverly with her granddaughter's fear of thunder. As a summer thunderstorm approaches Grandma relies upon her granddaughter's help to make a Thunder Cake. The granddaughter is busy collecting eggs from the hen house, milk from the cow, an over-rip tomato from the garden. Yes, a tomato. The cake must be made during a thunderstorm for it to be authentic Thunder Cake. By the time the cake is in the oven and the table is set, thunder is loudly crashing overhead. But when the cake is cool and frosted it is delicious; a tangible proof of bravery. A recipe for Thunder Cake, a chocolate tomato layer cake, is found in on a back page. 15 years ago, after being intrigued by a muffin recipe in Joy of Cooking, with the "secret ingredient" of tomato, I made a dozen. They were good. Therefore, it wouldn't surprise me if Thunder Cake was tasty, too. (Pub. 1990) I picked up a used copy. 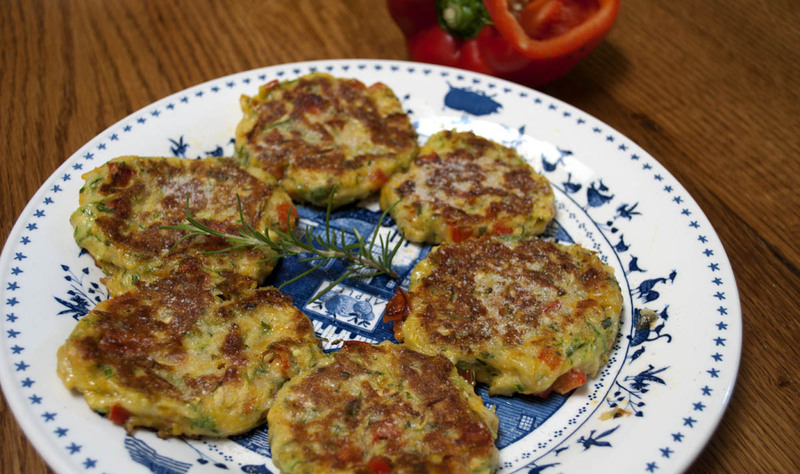 Zucchini burgers with garden herbs smell delicious while cooking. When summer brings zucchini, I make vegetarian burgers. A gluten-free, bell pepper-free batch for the Man-of-the-House. A batch with "the works" for me includes finely grated carrot. Yum. A generous helping of minced herbs from the patio garden add flavor: chive, oregano, sweet basil, thyme, parsley. I cook the burgers in butter and olive oil until brown and crispy on the outside, but creamy-soft inside. 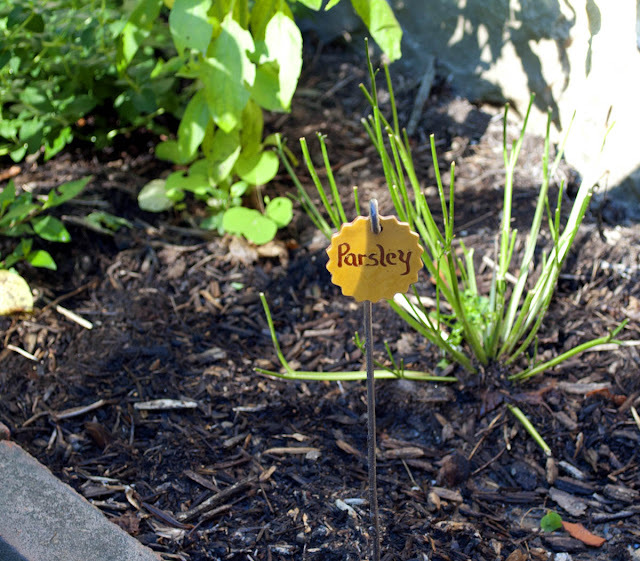 The parsley is store-bought. (Can you see why?) Peter Rabbit lives in the back yard. Benjamin Bunny lives in the front yard. They love parsley. And leave none for us. Dean noticed that finicky Peter won't touch the Italian herbs. "I wonder if the rabbits in Italy have acquired a taste for them," I said "I hope our rabbits never do." 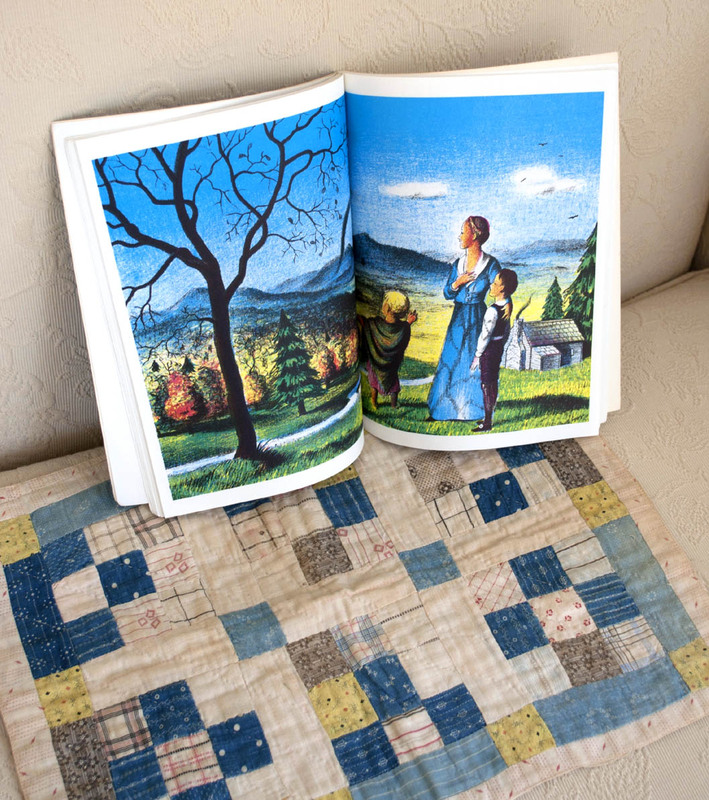 The little blue-and-yellow quilt is an antique doll quilt presented to me by a family we invited for lasagna dinner. It was a sweet and thoughtful surprise. At close inspection I see it was a young girl who hand quilted it because the quilting stitches are wobbly. Cute. I wonder what her doll looked like. The Mennonite Historical Society raises money each year with this enormous used-book sale out on their lawn. Some of the books fit under a tent. We found armfuls of gems. Books reviewed are linked to Amazon. Typing-in my e-mail reduces spam. Thank you. 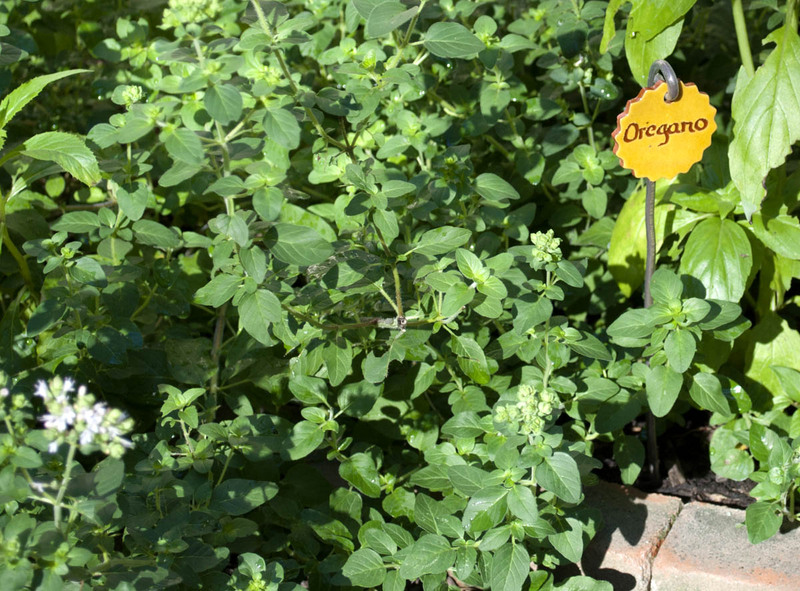 Tiny oregano flowers fill-out my little bouquet nicely. I have been knitting mittens and socks for the past few weeks. There is also a cardigan in the making. I'm working on the first sleeve now. I have plans for a teal Christmas scarf for my daughter. My mother came for dinner tonight. We talked about the musket and the puritan. Current events often leave us speechless these days. My mother used to say, "Use your good sense, child." I think whoever made the decision to enclose the musket in clay must have lacked an encourager of good sense. Enjoy the Christmas finding and making! Oh! Looking into some of these books for our children, thank you. That book sale would have me in a frenzy! One year we arrived late to our village book sale.I didn't know anything about it until we got there. They were trying to pack up and asked if we would please take as many home as possible...for free! I would love to have your recipe for the zucchini burgers. I tried making fritters this week, followed the recipe perfectly, and failed miserably. I was so disappointed, but your burgers look delicious. Zucchini is a funny vegetable. It perspires in the bowl. Therefore, I end up adding more "dry" to the "wet" ingredients. I make these by-feel. Beat one egg in bowl. ADD: 1 med. 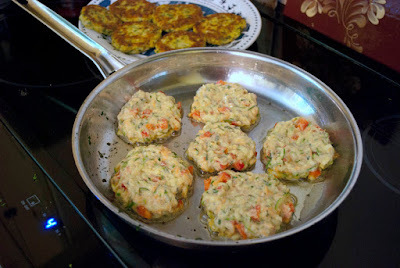 zucchini grated, half a carrot finely grated, pinch of salt, chopped fresh herbs (chives, sweet basil, thyme, parsley, oregano) half a cubed red pepper, one-third to one-half cup flour (or more) until the mixture is the texture of moist sticky dumplings (or mashed potato). Form into patties. Preheat skillet thoroughly on med/low heat. Add cold tsp butter, TBl olive oil (or more) to heated skillet. Place burgers gently in skillet. You should hear a sizzling sound, directly. Cook on med/low heat. Cover loosely if you like. But beware of steam when you remove lid. Flip (away from you) when light brown. Sprinkle with salt when done. I remember Thunder Cake from our Patricia Polacco days. I will never get too old for picture books. I think Out of the Woods will be fun to add when we get to the early 1900s in history lessons this year. 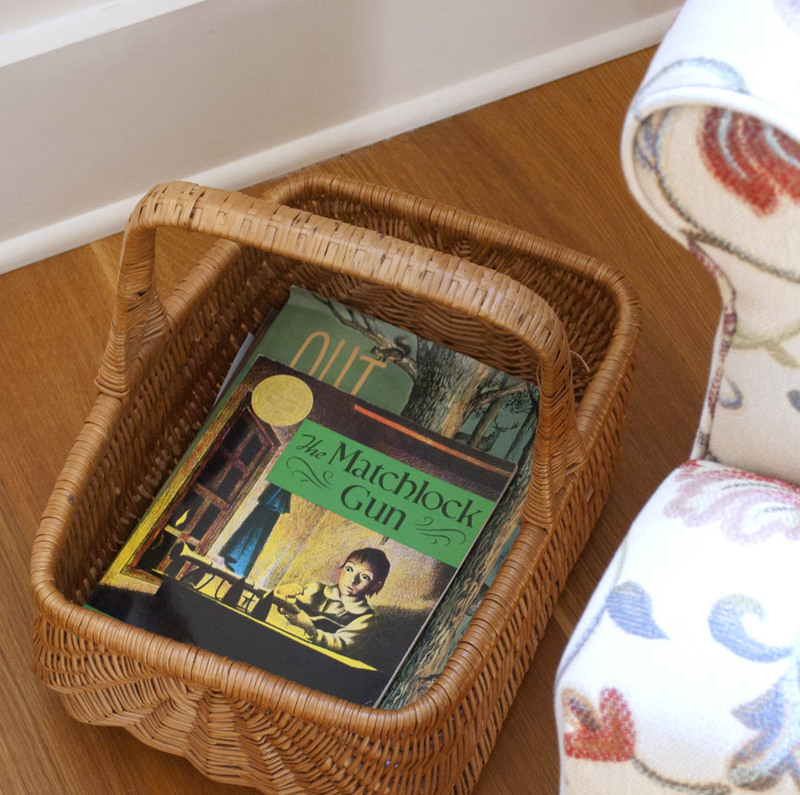 Even with older kids I like to use an occasional picture book because they give a sense of atmosphere. The Matchlock Gun is one my 9 year old will enjoy. My older kids read it several years ago. Current events are very disturbing and almost unbelievable. I will hear a story on the news and think surely it must be a hoax. But no, truth has become stranger than fiction. Where will this all end? Lovely book suggestions.ThunderCake has been a favorite with my kids when they were younger.I tried to make the cake during a thunderstorm with each child.It is a no fail recipe! I will look for the book Out of the Woods as it is one I don't know.What a wonderful book sale.Your handwork is inspiring.My grandmother always brought us hand knit mittens. It is a joy to read your posts. Thank you! As my daughters have grown older, I keep returning to picture books, and they don't mind! We all enjoy rediscovering an old favorite. Like many other moms, the older I get, the more sentimental I become, so that I often tear up when reading these beloved stories. We have read most of your recommendations, and we are looking forward to Out of the Woods. I am a pushover for illustrations. I recommend All the Places to Love by Patricia MacLachlan. It's a favorite I can hardly read to my daughters without a few sentimental tears! 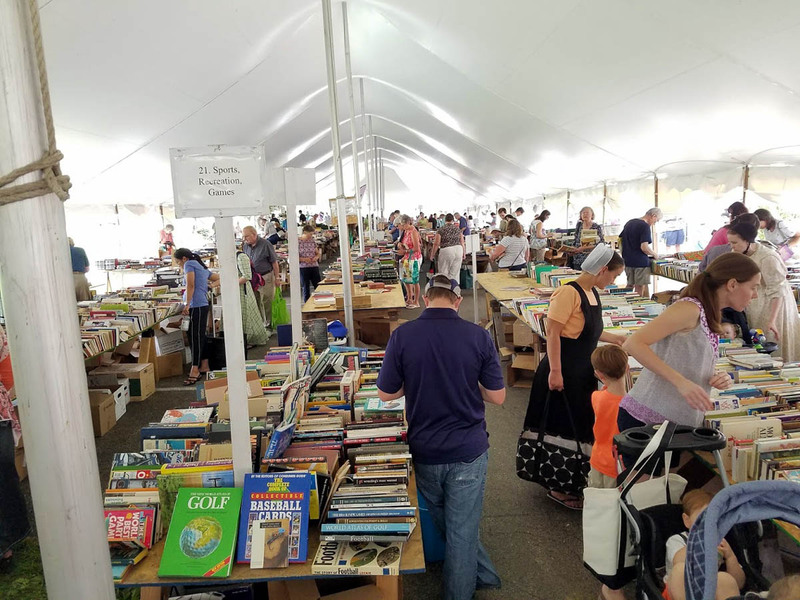 So glad you were able to find such a great used book sale... That is always a special treat. May you enjoy and be enriched by your finds. 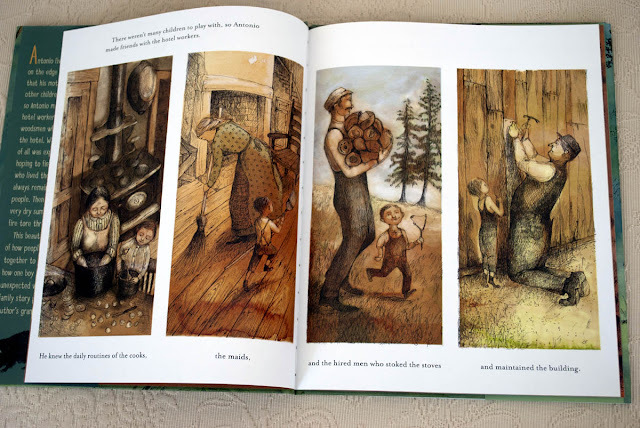 I get weak in the knees over a good picture book. Although I truly love each stage of my children's lives right through adulthood and independence, reading picture books with my children is probably one of the things I most miss about having young ones. Thank you for some new recommendations! 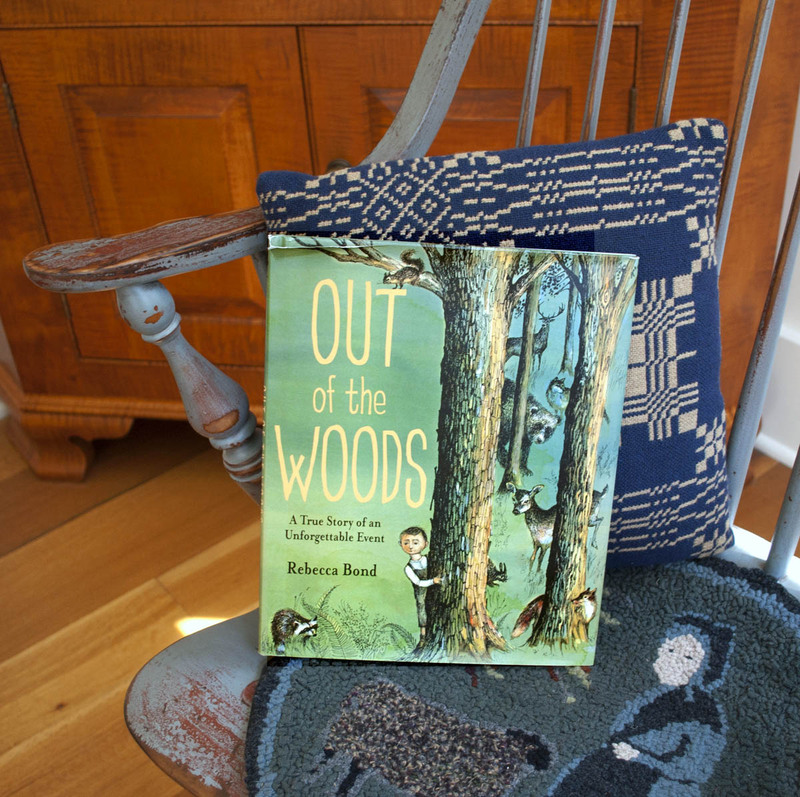 I will be checking out Out of the Woods at my local library. Intriguing. I think I might find a grandchild or two to share it with me. I love how you stage your book photos . 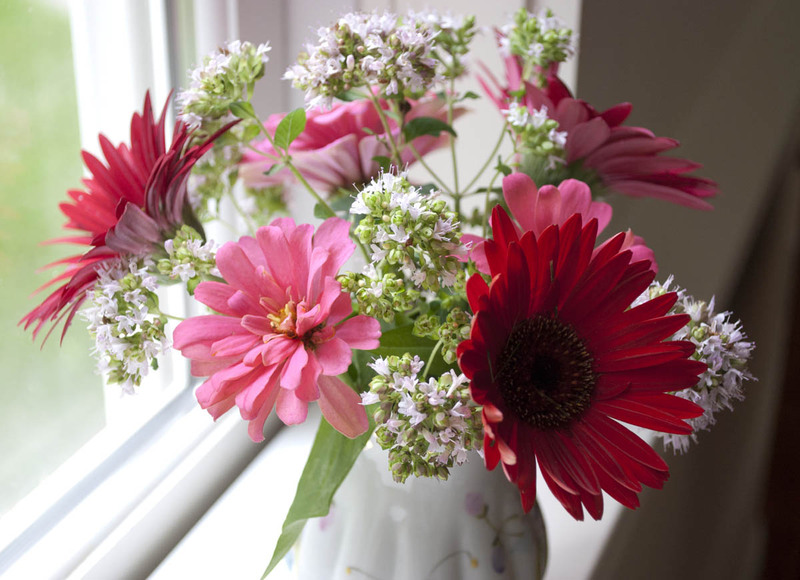 . . along with lovely "props" from your beautiful home. Out of the Woods looks wonderful and I'll be looking it up. 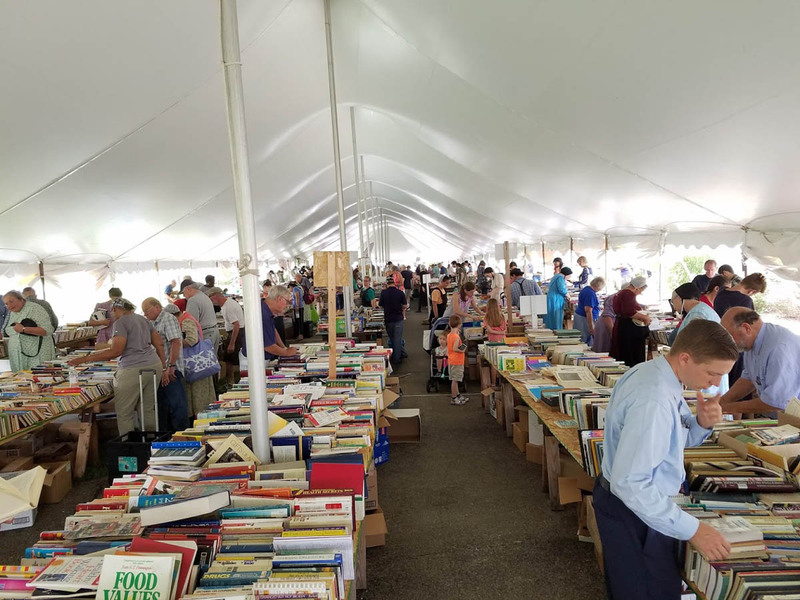 I missed that wonderful book sale this year. Glad you found treasure there! Thank You so much for this interesting and informative post. All the books look good but "Mailing May" really intrigued me. I will look into buying it. Karen there is nothing like a book sale. My sister and I would always go to our local library when they had one. Unfortunately they no longer have them. The mittens you made for your grand children are very nice. 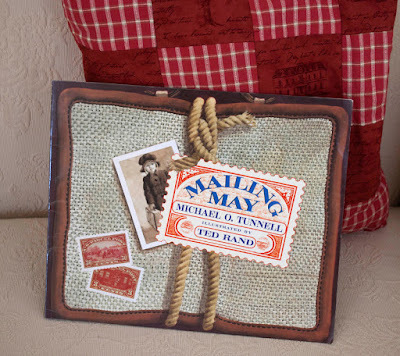 We LOVE Mailing May, a long time favorite! Out of the Woods is new to me, but I've just added it to our Christmas Wish list :) That book sale looks dreamy! Karen, my kids and I very much enjoyed "Out of the Woods." Thank you for recommending it. There is a good lesson in it for us, I think. What a great post. I was so interested in the books you reviewed. The pictures in"Mailing May" are beautiful. The pictures alone are worth the price. I enjoyed the "Thunder Cake book. My older sister said our Maternal Grandmother would take her dog and hide in the closet whenever there was thunder. Thanks again for the reviews and this interesting and entertaining post. Oh Karen, you stirred my heart and memories this morning with your words! The books and mittens make me long for the days when I will once again have littles around. Well, at least I hope I will have grandlittles around! I was so moved, I featured it in My Happy Homemaker Monday and Daybook post this morning. God bless you dear lady! Praying for you this morning just as soon as I hit publish! We homeschool moms have a museum of memories to cherish. The first mitten I ever knit (in 1989) is kept in a dresser drawer. It's match has long been lost. Congratulations on your last day of chemo, Laura. Your fortitude encourages me. (It has been quite a while since my last comment, so I hope you will still remember me). I have a substantial library of children books, love them too much to depart with them, and of course, I want to be able to share them with my grandchildren in the future. Interesting indeed, how parts of our nation's history, the way of life, are clearly recorded in many of those books, and yet there are those who would bury or snuff out certain truths. Love your growing supply of knitted mittens! Yes, Cathy, you are a fellow knitter and blog reader from years back. And I remember when we were both happened to be reading the book, "Knowing God" by J I Packer, in the same month.